Howl is a heavy metal band based in Providence, Rhode Island. The group released its sophomore album Bloodlines in April of this year. I contacted guitarist Josh Durocher-Jones, who was brought in shortly after the band released its debut in 2010, to ask some questions about how Bloodlines came together and the group’s creative process. Alex: "Howl is from Providence, which has some great music but isn’t really known for the type of metal you play. How did you find your sound, which is perhaps more reminiscent of Georgia or California scenes?" Josh: "The band is actually from all over. I grew up in Cleveland, Ohio and joined Howl in Jan 2011. Location didn’t have much to do with it – the guys met in college and were all into all sorts of metal. I was in a metal band in Cleveland, but it was more like the DIY Punk scene that was popular there. When I joined Howl it was more familiar territory for me. Being metal heads, regardless of who we’d played with, we just wanted to make something heavy." Alex: “'Bloodlines' seems to be a more focused record than its predecessor, yet it contains more diversity vocally and rhythmically. What were your goals going into recording, compared to your debut?" Josh: "We actually set a lot of them. We didn’t have anything written going into the process, and we wanted to focus more on the aggressive side and highlight an element of the band that took a back seat on previous recordings. We wanted more focus, we wanted riffs that were catchy with big hooks. We wanted to get people banging their heads during the live show. We wanted to take you on a journey. The idea was for the record to be a little bit of everything – we like so many different styles that we want to a be a band that plays more than one genre." Alex: "Songs like 'Midnight Eyes' and 'One Last Nail' have a more melodic sound to them – perhaps comparable to bands like Killswitch Engage or Lamb of God. Is the more up-tempo feel of 'Bloodlines' a conscious attempt to cross over or a natural progression of your sound?" Josh: "I definitely think it was natural, but it’s also something we wanted to highlight. We wanted to write an album that we could play any song off it live and get the crowd going. We had that mindset going into it to have that aggression and spontaneity, that live feeling on the songs. Melodically, it came out completely natural – personally, I’m into melodic things and I brought some of that to the table with the guitar harmonies. As for Vincent, he wanted to do something different, more complex than just barking. I don’t think he knew he was capable of the performance he delivered. He had sort of an “a-ha!” moment there in the studio." Alex: "Metal is often deeply personal, and your titles seem to address darker issues, facing life and death. Where do you get ideas for your subject matter, and do they deal with personal experiences?" Josh: "That’s more of a question for Vincent since he writes all the lyrics, but there are definitely some themes throughout the album. Metal is often about being an outsider, so the songs play on that, but sometimes it’s nice to just throw up the horns an get the crowd to chant along. On the other hand, Vincent had some ideas that appear a few times. A lot of the lyrics have to do with religion’s capacity to become a disease, and the outcomes of that." Alex: "Thanks, Josh. I'll be covering shows in the Providence area this summer if you guys are planning a supporting tour." Josh: "No problem. We'll be announcing a tour shortly, with the kickoff show in Providence on July 20. See you there!" 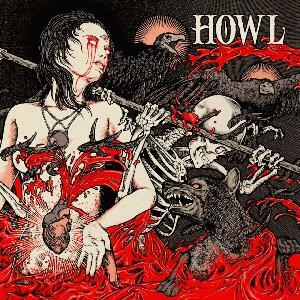 Pick up Howl's new album Bloodlines on iTunes, Bandcamp, or in stores now.